The demands that the military have on a families time, flexibility and energy can be overwhelming when trying to settle into a routine. Numerous articles are available about the topic of employment challenges for military spouses due to the relocation factors that are part of military life. Right now we live in a time that it really has never been easier starting a military friendly business from your living room. What qualifies as a military friendly business? Flexibility in location: Over the last 25+ years the internet has become an ingrained part of our society and how we go about day to day tasks. This has also impacted how and what can be seen as a business for many people. No longer do you need to have large amounts of capital, be tied to a physical location and long periods of setup before 'opening for business'. With a laptop and an internet connection, you can now run a business anywhere you like. Flexibility in time: The restrictive nature of brick and mortar businesses provide some level of congruency in knowing when you need to be there and when you'll be able to leave. On the other side of that coin, this is the exact problem many business owners face...you MUST be there from opening to closing to make sure you are maximizing the time to generate sales and income. Your internet based business is open 24/7 and typically 80-90% of the work can be automated with systems. Work when it makes sense for YOU. Flexibility in size of operation: If you purchase a franchise or start a store or business, you'll need to have a certain amount of sales and revenue to make it profitable. The scaling of that business either up or down is also more restrictive. Expansion of a business online typically will only require an increase in successful advertising campaigns and possibly upgrading some technology to handle more 'traffic'. This is the power of systems and tools that allow your business to be automated and scalable! What are some examples of military friendly businesses? All these choices meet the criteria of the 3 F's...not location specific, flexible working hours and can be scalable based on your goals. 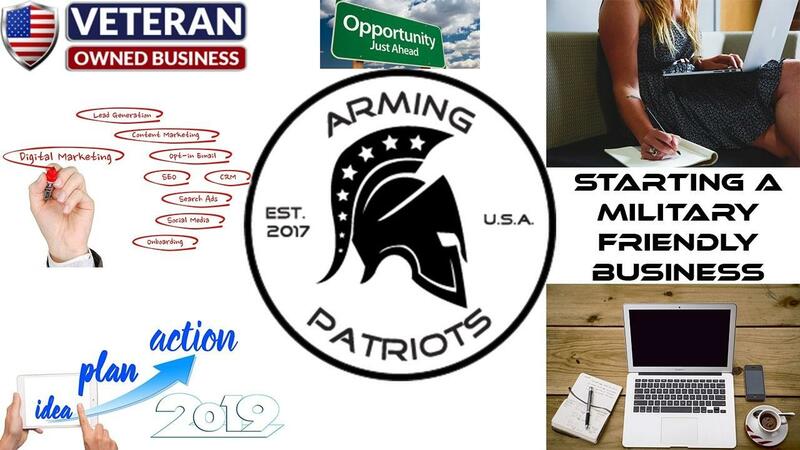 Here at Arming Patriots, we have made it our mission to help active duty military, veterans and their family members more aware of the opportunities available today and provide the guidance and training to enter this world of digital marketing. By-passing the traditional pathways that are talked portrayed opens new opportunities and greater chances of success. Whether you are looking to get started in Network Marketing or Direct Sales, learn about affiliate marketing or become trained in digital marketing...we are here to assist you in the process. Reach out and let's get you started! Take the first step in joining the Arming Patriots Community. Find out all about Arming Patriots and what this community is all about.